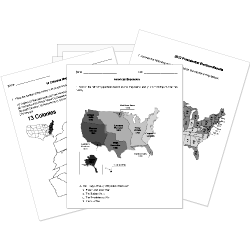 You can create printable tests and worksheets from these Grade 9 American Revolution questions! Select one or more questions using the checkboxes above each question. Then click the add selected questions to a test button before moving to another page. Why is Crispus Attucks a significant figure in the Revolutionary War? He was the first casualty of the American Revolutionary War. He was the first African-American U.S general. He was an abolitionist during the war. What Acts passed by King George III lead to the Revolutionary War? What year did the Boston Massacre take place? Armed American civilians who were active in the Revolutionary War and in the period just preceding the war. Group of politicians that made laws. Which two acts combined to create the Intolerable Acts? The founding fathers insisted the new United States have a standing army. The MAIN reason colonists were upset about being taxed was because . Which year did the Intolerable Acts take effect? The document that officially ended the war was called . It was called the “Boston Massacre” because . a large number of people were killed indiscriminately. the killing started in Boston and continued throughout the rest of the colonies. patriots wanted to get other colonists on their side to fight against the British. Loyalists wanted to get the British soldiers on their side to fight against the colonists. Document written by Thomas Paine to convince the Colonists to support becomming independent from Great Britan. What did the Quartering Act do? It required colonists to pay a tax of 25 cents for every pound of sugar they bought. It required colonists to pay a tax on tea. It required colonists to pay a tax on all official documents. It required colonists to allow British soldiers to stay in their house. We began our march for Virginia; the weather pleasant and roads tolerably good. We Passed through Frederick Town (Maryland), where there were some British prisoners quartered; they turned out to see us. Next day we reached the Potomac River…We continued a few miles and camped...We are seldom allowed to eat until twelve o'clock, after the arms are stacked, knapsacks taken off, and water sent for. We joined the troops under command of Lafayette…The enemy advanced no farther than to the ground we left. We could not have been engaged longer than about three or four minutes. Our losses are said to be upward of one hundred killed and wounded. Lieutenant Herbert was taken prisoner. The horses were all killed. An officer, surgeon, and a few men sent to bury the dead. This morning we had the pleasure of seeing the enemy’s drummer in the distance, and immediately we saw an officer holding up a white handkerchief. All is quiet. Surrender documents have been signed; French and Americans take possession of British forts. Who was the author of this document? Where was Crispus Attucks born? The War of Independence from Great Britain began in . Who was coined the father of the Constitution of the United States?